Relay for Life brings communities around the world together to honor cancer survivors, remember loved ones lost and raise funds to support cancer research. Over the past 10 years, the Notre Dame Relay has raised more than $1.2 million for the American Cancer Society (ACS). This year, 44 teams have pre-registered for the event, already raising more than $80,000. Pre-registration is not required but is encouraged. Teams and individuals can register at the door on the day of the event. Registration is $10 per adult and includes a T-shirt. Children younger than 12 are admitted free with a paid adult. 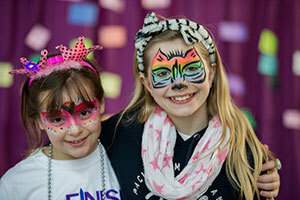 Open to the community, the Notre Dame Relay for Life will feature activities for youth and adults including a mobile auction, ice skating, games and food for purchase. Along with the traditional format of Relay for Life events, which includes walking laps to raise funds, additional activities scheduled throughout the night include Zumba, karaoke, a broomball tournament, balloon twisters, face-painters and more. Members of Notre Dame athletics teams, including football and hockey, will be in attendance and available for photos and autographs. The University leprechaun and members of the marching band and will also be participating. A highlight of the evening will be the luminary ceremony at 9 p.m. to honor and remember those who have or have had cancer. Luminarias will be available for purchase at the event. The partnership between Notre Dame and ACS extends beyond this event and includes cancer research support. The ACS has awarded the University 13 research grants, totaling more than $4.7 million, allowing ND faculty and students to conduct innovative cancer research. For more information about Notre Dame’s fight against cancer and to register for Relay for Life, visit relay.nd.edu. Originally published by Notre Dame News at news.nd.edu on April 10, 2015.